May 2017 – loudlatinlaughing – Euge! Euge! Not surprisingly, I did not “feel myself getting smarter, my brain expanding while I read this,” unlike the idiotic character in I’ll Tell You In Person, which is where I got the breadcrumb to check out W. Somerset Maugham’s classic novel. I’m actually quite tired of reading books by gay men that make women into the shallowest of characters, ugly, grasping, with no redeeming qualities, while the men are heroic, handsome gods. This book strained every nerve of that kind. If I identified with anyone in the book, it was Larry, the quiet and curious character who the entire thing is about, following his strange travels around the world “to loaf” by which he meant to study and read up and discover the meaning of life. He’s adamant about rejecting the normal path of office work and ends up losing a girlfriend/fiancee as a result. Isabel doesn’t take too kindly to the monkish aesthetic that Larry cultivates in his tiny Parisian apartment and can’t imagine herself without access to society, gems, furs, etc. I’ve never wholeheartedly liked anything that Marghanita Laski wrote, including this novel, which is the only thing I’ve been able to finish of hers. Post-war destruction/erosion of the class system played out via the romance of an upper class yet poor as a church mouse woman and a hardy, hard-working, up-and-coming son of her old charwoman. They start seeing each other when they find themselves both stood up for movie dates on Friday night, Margaret with her girlfriend Jill and Roy with his ex-girlfriend. They carry on a clandestine relationship and once Roy finds them a place to live, break the news to Margaret’s parents who refuse to give consent to wed. Eventually, and by forcing the young couple to emigrate to Australia forgodsake, they agree. 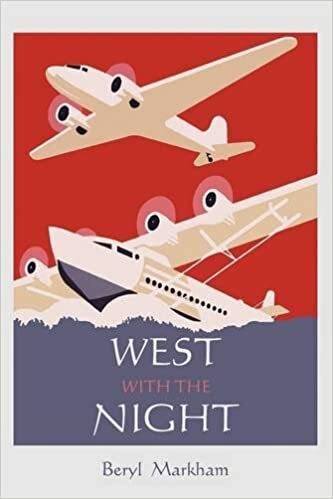 Fantastic memoir by Beryl Markham about her childhood on a farm in East Africa (Kenya), becoming a horse trainer and then a freelance pilot across Africa. She was the first woman to fly solo across the Atlantic from east to west (thus “West with the night” as the title), ending up with her plane nose-first in the mud on Cape Breton after it runs out of fuel. Incredibly well-written and entertaining, with equal parts adventure and understated philosophy. Author lzPosted on May 29, 2017 October 25, 2017 Categories Reading ArchiveTags YES! I know, I know, I know. I should exercise more. And this book points out the many ways it benefits not only your body but also your brain. I enjoyed this book, surprised that it was not just another “shoulda been an article but I beefed it up into a book” type book. I think what saved him was the inclusion of so many stories, of patients, or of research papers and studies. He gets pretty technical, and you learn some stuff about the old noggin, like the fact that serotonin, dopamine, and norepinephrine are all neurotransmitters. It starts out strong, with two examples of schools that boosted their test scores by implementing a new way to do gym, that of focusing on heart rate for participation, not just performance. Exercise gets the blood flowing, gets your brain fusing new pathways, gets you ready to learn. Chapters touch on stress, anxiety, depression, and specific changes that women go through monthly and then through menopause. Throughout it all, a drum beat to get 5 days of exercise of 30 minutes at a minimum. This is just the safe side. Best? 6 days a week, 45min to an hour, four days longer with moderate intensity and 2 days shorter with higher intensity. The rest of the book purports to explain this reaction, to soften the blow. We learn that Duke, the father, was a con man, lying his way through decades of life, making up a Yale education, pretending not to be Jewish, scamming merchants and frequently fleeing town with creditors at his heels. Very Catch Me If You Can, but instead of feigning to be a doctor or pilot he became an aerospace engineer and worked on the bombing planes that delivered the end of WWII. These Duke-focused tales are actually quite good, but the author insists on his own position in the story, inserts himself. I yawned at his extended descriptions of boarding school and racing boats. Only when the end was nigh did my attention get re-engaged, when Duke is jailed in California and the author sending checks back. Intriguingly, he mentions his father having a wooden suitcase that when unfolded became a boat that he paddled around the harbor in Martha’s Vineyard. She loves name dropping, Cheryl Strayed is a BFF that she babysits for and has dinner with all the time, Maggie Estep, Ilana Glazer, Abbi Jacobson, Gaby Hoffman. Surprisingly, she had an unnamed celebrity in Hungry Ghost (how on earth did she control herself??). Not the worst book, but not the greatest. I much prefer Roxane Gay’s non-fiction, if this collection of short stories is any indication. Seems like the most difficult part of the women was that they all enjoyed violent men and sadistic pleasures. Maybe the best story was the first, written in 1st person so you weren’t quite sure if the childhood kidnapping had actually happened to her and her sister. I suppose the next best would be the story of studying in the Upper Peninsula of Michigan, falling in love with a logger and being the only woman grad student in the engineering lab. A bit of a letdown overall. Blargh. A book about aging infused with the usual: literary reminisces, personal story, family life. Somehow this missed the mark, despite it looking quite appetizing. She’s a good writer, but got on my nerves a bit. Ultimately the only thing I got out of this is a handful of book recommendations (du Beauvoir’s The Coming of Age, Wharton’s Twilight Sleep, Colette’s Break of Day). I think mostly I rejected this because it is far from my own experience, she blathering on about her closeness to her daughter, her missing her father after his death. Here’s a book you can skip. Go ahead, just remove it from your list, and instead of spending a few hours rage-reading it like I did, go for a walk in the analog world. The book is a pointless blather wherein dudes mansplain to you how analog beats digital because of the human touch. I’m a sucker for these types of books, being an inveterate physical book lover and handwritten letter person, but the only real use of this book is as a door stopper, maybe a fly swatter. One of the biggest problems with the book was the insistent inclusion of the author on every page, announcing “Me! Me! Me! I did this and I talked to this person and I raised my hand and asked this question.” This would be less of an issue if I actually liked the author, but his smarminess oozes through and I had to gag back reactions to keep plowing through. The first tedious thing about the book is the chapters and book sections. Everything is couched in “The Revenge of the ….” terms, ad nauseam. This makes sense for some parts, like vinyl records, moleskin notebooks, Polaroid film, and (WTF?) board games. But it’s absolute garbage when it comes to the second half of the book, trying to prove that “analog work” is better than digital by using the Shinola watch company’s manufacturing example in Detroit. Huh? And the emphasis on meditation in Silicon Valley life. These are neither analog nor digital things. In his longest chapter, he drones on about the joys of vinyl purchasing, and how record stores knew that vinyl was on the way back when “Girls!” started buying records again. I was more interested in his chapter on paper, and do agree that its benefits outpace those of digital, with the advantage that you don’t need to worry about technology being around to allow you to read it in a few years time. He includes a quote from a creative director at Mohawk Paper (erroneously) saying that digital natives are the most interested in paper, despite not having nostalgia for it. The only useful bit of information in here are some stats on bookstores, which he credits as being the revenge of retail, an ill-timed assertion in this era of zombie malls and death knells of retail. Low point was 2009 of 1650 independent bookstores, down from the high point of 4000 in the 90s. The Strand in NYC is called out for special notice, with parenthetical explanation that it has survived because it owns its building. He also cites the bold example of a sweatshirt he saw in a store window, prompting purchase, as evidence that in-person buying is more powerful than online. I hoarded this book, waiting until the perfect opportunity to immerse myself in its pages. That moment arrived over the past weekend as I was nestled in a chair on a mountain top in Mendocino County, listening to the cacophony of birds, feeling the heat of the California sun bake the land around me. Every so often, I’d bark out another amazing tidbit from the book, and by the end of the trip, I’d resolved to return to the northern lands for further exploration of Lassen, Mt. Shasta, and the Trinity area. 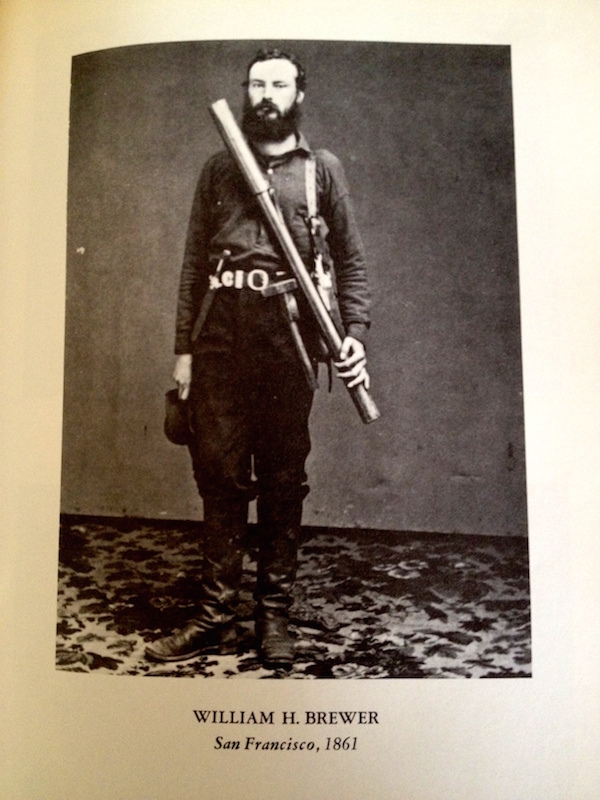 This book is a collection of letters written by the lead naturalist, William Brewer, back to his family in New York. While not educated as a geologist, he carefully studied the strata and made excellent notes for the expedition, the goal of which was to produce a report and a complete Geological Survey of the state of California. Mining fever obviously played a part in funding this act of April 1860, and the commission was led by Professor Josiah Whitney, who promptly selected Brewer to be his chief of staff. Whitney occasionally ventures out to join the group, but mostly seems caught up with fundraising activities. Brewer is the real leader of this rag-tag group of geologist/botanist/camp men. The journey begins with a trip south out of San Francisco, where the crew sails down to Los Angeles, population 3,000. “The weather is soft and balmy—no winter but perpetual spring and summer. 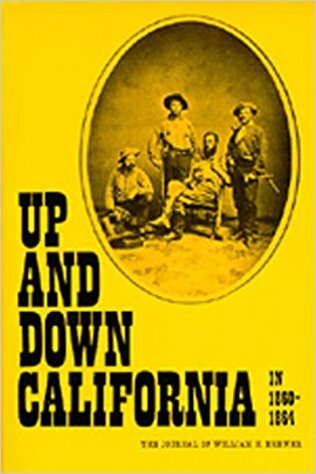 Such is Los Angeles, a place where ‘every prospect pleases and only man is vile.’ … The grapes are famous, and the wine of Los Angeles begins to be known even in Europe.” They outfitted themselves with buckskin pants, said to prevent rattlesnake and tarantula bites. Throughout, he mentions the bits of news he gets from month-old papers about the war raging back east. California is solidly for the Union, but he makes disparaging remarks about the desperadoes and “white trash” who are “Secesh”- pro-secession). He has the prevailing racist attitude about the Indians and frequently makes no further comment about the white women he encounters other than their beauty. But he’s a fan of Dickens, referencing Pickwick and mentioning finishing reading Bleak House over the campfire. Champagne is consumed in quantities larger than expected, at every civilized house. Lake Tahoe was originally called Lake Bigler after Governor Bigler who turned “Secesh” so pro-Union papers called for the name to be reverted to the old Indian name of Tahoe. Earthquakes dot the tale, men rushing naked out of baths to head into the city (1861). He mentions “Russian America” by which I suppose is meant Alaska? Author lzPosted on May 23, 2017 October 25, 2017 Categories Reading ArchiveTags YES! B went on a biking and birding tour of SF recently and came away with this recommendation from Josiah, our resident eco-nerd. The book was terrific, especially when sipped between sunlight patches in the wilds of Northern California near Ukiah. My biggest takeaway is that the natives were gardeners in this state, deeply involved in cultivating the seeds/bushes/wildflowers that gave them sustenance. They also were careful not to over-harvest, always leaving something for the next person to come behind and gather, leaving something for the next season to build on. Also, controlled burning had a real value and purpose, which we’ve abandoned. Large quantities of quail: “In 1867 we moved to a ranch located between ‘Spanish-town’, now called Half-Moon Bay, and San Gregorio, on the coast side of San Mateo County. There I saw quail by the thousands everywhere…” – she mentions flocks being common of from one to five thousand. Another naturalist mentions a “plague” of quail at the missions. So what happened? In the 1880s and 1890s, millions of quail were shot or trapped; in 1895-6, 177k quail were sold in LA & SF. The natives didn’t just submissively accept their fate of being snubbed out, they resisted with both active and passive actions. Whites plowed ahead with over-harvesting everything they found in the garden that natives had cultivated. “By 1900, 40% of California’s 31 million acres of old-growth forest had been logged.” Between 1850-1910, relatively few Europeans and Asians caused major declines in dozens of bird & mammal populations, denuded entire landscapes, accelerated erosion, destroyed countless acres of productive wildlife & plants, decimated Indians & their culture. Yay! Seed collection was done with seed beaters to remove edible seeds, falling directly into their baskets. To avoid rattlesnakes: smear arms & legs with tobacco (snakes supposedly hated the smell); also wore shiny ornaments to startle the snakes. Sierra Mowok used 48 types of greens; we commonly eat about a dozen greens.